Every single Blosom Fingerboard is carefully made by hand and proudly built in the UK. 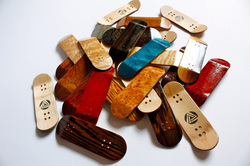 Blosom uses a wide range of exotic and rare veneers, with various dyed plies, for a clean, unique and long-lasting deck. Each Fingerboard we sell to you has our seal of approval on the top, so you know that your deck has met our rigorous standards. Medium kicks, with a slightly higher and longer nose. Low defined Concave, for a comfortable ride on your fingers.